Brissett could be traded this offseason but the Colts' asking price is high, Joel A. Erickson of the Indianapolis Star reports. 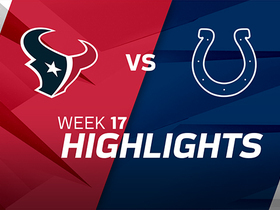 Brissett replaced Andrew Luck on the final play of Sunday's loss at Philadelphia. He threw a 60-yard Hail Mary pass that fell incomplete on his only pass attempt. Analysis: With the Colts needing a long Hail Mary to win the game, Brisset was used for his stronger arm. Luck is clearly the starting quarterback, but the move could be seen as the team still having some concern about Luck's shoulder after he missed all of last season. Notably, head coach Frank Reich said Brissett's usage was only because of his strong arm. Brissett completed eight of 12 passes for 68 yards and a touchdown while playing two drives during Thursday's preseason game in Cincinnati. 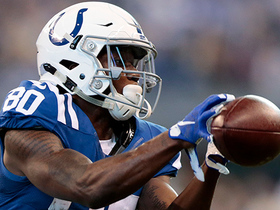 Analysis: Brissett's first drive ended with a Robert Turbin fumble and the second ended with a two-yard touchdown pass to WR Zach Pascal. A high-end backup quarterback is more valuable on a team with legitimate Super Bowl aspirations, but the Colts have made it clear they'd need to be blown away by an offer to even consider trading the 24-year-old. The calculus might change next offseason when Brissett is entering the final year of his rookie contract. Brissett is expected to start Thursday's preseason game at Cincinnati, Andrew Walker of the Colts' official site reports. Analysis: Andrew Luck has received enough work in the first three games (32 pass attempts, five rushes) to not press his luck with a minor foot injury in tow. With Luck out of commission, Brissett will act as the starter in the Colts' exhibition finale, as he did 15 times last season. Entering the campaign as Luck's backup could lead Brissett to see the field this season, especially considering the former's injury woes the past few years. Brissett threw for 172 yards and rushed for nine more in Monday's preseason loss to the Ravens. 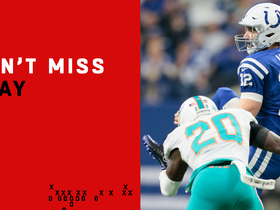 Analysis: Brissett got most of the usage during Monday's outing, and while he failed to throw a touchdown pass and completed just 60 percent of his passes (14-for-23), he did lead the Colts on two scoring drives that culminated in 10 points. The Colts seem to have plenty of confidence in Brissett's ability as a backup quarterback with Andrew Luck set to make his return from a shoulder injury. Colts owner Jim Irsay said the team would need a sizable offer to trade Brissett. "All of a sudden, we have the best backup quarterback in football," Irsay told the Indianapolis Star. "I don't think we'd accept a (first-round pick in a trade) for him, we think he's that good." 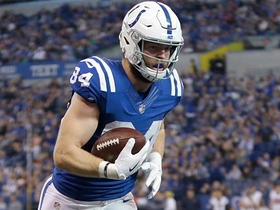 Analysis: With Andrew Luck set to begin the season as the starter in his return from a shoulder injury, Brissett may not see many snaps this season. He's a candidate to be traded as a result, but the Colts may not be so confident in Luck's health that they would trade Brissett for a non-significant return. Brissett will take reps with the first team when Andrew Luck is sidelined, Kevin Bowen of ESPN reports. Analysis: Brissett started 15 games for the Colts last year while Luck missed time with a shoulder injury. Luck is back and is the clear starter this year, but Brissett should still get a good amount of work in during camp. Luck will get regular days off to rest his shoulder, and Brissett will pick up the first-team reps on those days. 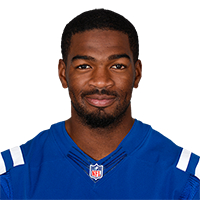 The Colts turned down a pair of trade offers for Brissett, with general manager Chris Ballard hinting that he wants to retain the 24-year-old quarterback, Stephen Holder of The Indianapolis Star reports. "He's committed, he's a great teammate, he's got juice, he holds people accountable, he holds himself accountable. I love Jacoby," Ballard said. "Jacoby Brissett is going to play in this league a long time. If I learned anything last year, it was the value of a backup quarterback who can get it done, and I think Jacoby can do that." Brissett was 15-of-25 passing for 114 yards with a touchdown and no interceptions in Sunday's win over Houston. Brissett completed 16 of 33 passes for 215 yards and a touchdown during Saturday's 23-16 loss to Baltimore. He added eight yards on the ground on three carries. Brissett completed 17 of 30 passes for 158 yards with no touchdowns or interceptions in Thursday's 25-13 loss to the Broncos. He also rushed five times for 18 yards and a touchdown. Brissett completed 11 of 22 pass attempts for 69 yards and a touchdown Sunday against the Bills. He also carried three times for 10 yards in the 13-7 loss. Analysis: Brissett's attempts were in part limited by the incessant snow in Buffalo, but he still struggled in completing 50 percent of his passes for what was by far his lowest yardage total in any start this season. His production has dropped off since the team's bye in Week 11, with three turnovers, two touchdowns and an average of 146.3 yards over the last three games. Brissett will face an inconsistent yet experienced Broncos defensive unit on Thursday. Brissett completed 21 of 36 passes for 174 yards, one touchdown and two interceptions while rushing six times for 36 yards in Sunday's 30-10 loss to Jacksonville. Analysis: Brissett came in as the league's most-sacked quarterback while Jacksonville entered with a league-high 41.0 sacks, so it wasn't surprising to see him brought down four times in this one. The highlight of Brissett's day came in the third quarter on a 40-yard catch-and-run touchdown to T.Y. Hilton. Owners shouldn't have been expecting much more, given the difficult matchup. Brissett completed 17 of 29 passes for 196 yards without a touchdown nor interception while rushing three times for 16 yards and losing one of two fumbles in Sunday's 20-16 loss to the Titans. Analysis: Brissett wasn't asked to do much for most of this one, as strong play from the defense and running game had his team up 16-6 late in third quarter. 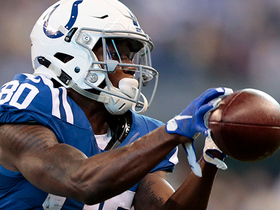 Things all came apart from there, however, as a toss to Marlon mack gone awry led to a fumble recovered by Tennessee at Indianapolis' four-yard line. 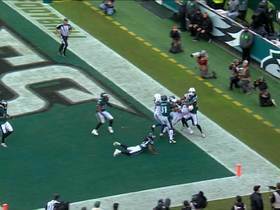 Delanie Walker's ensuing touchdown promptly made it a three-point game and Brissett had no answer after the visitors took the lead for good with 5:59 left in the fourth. 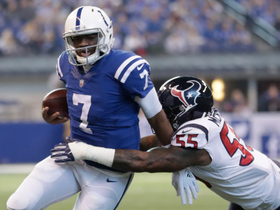 Brissett was cleared of concussion symptoms by an independent neurologist Friday, paving the way for him to start Sunday's game against the Titans, Mike Chappell of CBS 4 News Indianapolis reports. Analysis: Brissett was placed in the concussion protocol after feeling "mild" symptoms following the Colts' last game Nov. 12 versus the Steelers. Benefiting from a Week 11 bye, his ability to take every practice rep this week forecast his clearance from the protocol. He'll thus face off against a Titans defense that has given up 275 yards passing per game and eight touchdown passes to opposing quarterbacks over its last three outings. After practicing fully all week, Brissett (concussion) does not carry an injury designation for Sunday's game against the Titans. Analysis: Per the Indianapolis Star, Brissett still needs to pass the evaluation of an independent neurologist to be fully cleared from his concussion, but that visit is slated for Friday afternoon. Barring any unexpected setback on that front, Brissett is on track to remain the Colts' starting QB in Week 12. The Colts have listed Brissett (concussion) as a full practice participant this week. Analysis: Brissett continues to progress through the league's concussion protocol, but given that he's practicing fully, with no reported setbacks, we expect him to be cleared by an independent league neurologist in advance of Sunday's game against the Titans. Coach Chuck Pagano indicated Wednesday that Brissett is in the non-contact portion of the NFL's concussion protocol, Kevin Bowen of 1070 The Fan Indianapolis reports. Analysis: The report also notes that Brissett is in line to have some controlled contact after Thursday's practice. Per Zak Keefer of The Indianapolis Star, Brissett will be evaluated by an independent neurologist after he works out Thursday, and the expectation is that the quarterback will receive medical clearance by Friday. Assuming that's the case, Brissett will be on track to start Sunday's game against the Titans. Colts head coach Chuck Pagano said Monday that Brissett remains in the NFL's concussion protocol, but the quarterback is expected to start Week 12 against the Titans, Zak Keefer of The Indianapolis Star reports. Analysis: Brissett entered the protocol after developing symptoms following the Week 10 loss to the Steelers. With the Colts coming off a bye week, Brissett will likely just need to put in a practice or two and receive clearance from an independent neurologist before he's lifted from the protocol. Brissett did take snaps in Monday's practice, but it's unclear how involved he was during the session. Brissett is in the NFL's concussion protocol after developing symptoms following Sunday's 20-17 loss to the Steelers, Stephen Holder of The Indianapolis Star reports. Analysis: Per the report, the QB was checked out twice during the course of Sunday's game, but he was deemed able to carry on. In the process, Brissett completed 14 of 24 passes for 222 yards with two TDs and a pick to go along with four carries for seven yards. Brissett will now have added time to recover from his concussion symptoms, considering the Colts are on bye in Week 11. Brissett completed 20 of 30 passes for 308 yards and two touchdowns while adding two carries for 12 yards and losing a fumble in Sunday's 20-14 win over Houston. Analysis: Brissett connected with T.Y. Hilton for a 45-yard touchdown in the first quarter and would have taken at least a 10-0 lead into the locker room if not for a 34-yard sack-fumble touchdown by Houston with under a minute left before halftime. The 23-year-old quarterback added an 80-yard score to Hilton in the second half while topping 300 passing yards for just the second time in his career. 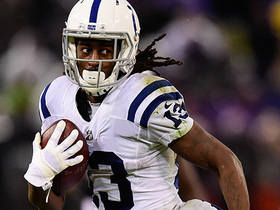 He'll be a serviceable option for the rest of the season with Andrew Luck (shoulder) on injured reserve. With Andrew Luck headed to IR, Brissett is slated to remain the Colts' starting QB going forward this season. Indianapolis Colts quarterback Jacoby Brissett throws to quarterback Andrew Luck for a successful fourth-down conversion. 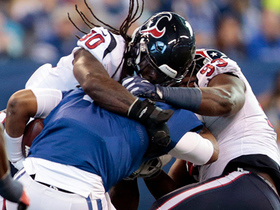 Houston Texans linebacker Jadeveon Clowney shared a sack with defensive tackle Chunky Clements on Indianapolis Colts quarterback Jacoby Brissett. Indianapolis Colts wide receiver T.Y. Hilton shows toe-drag swag on a slick 15-yard catch on a pass from quarterback Jacoby Brissett.